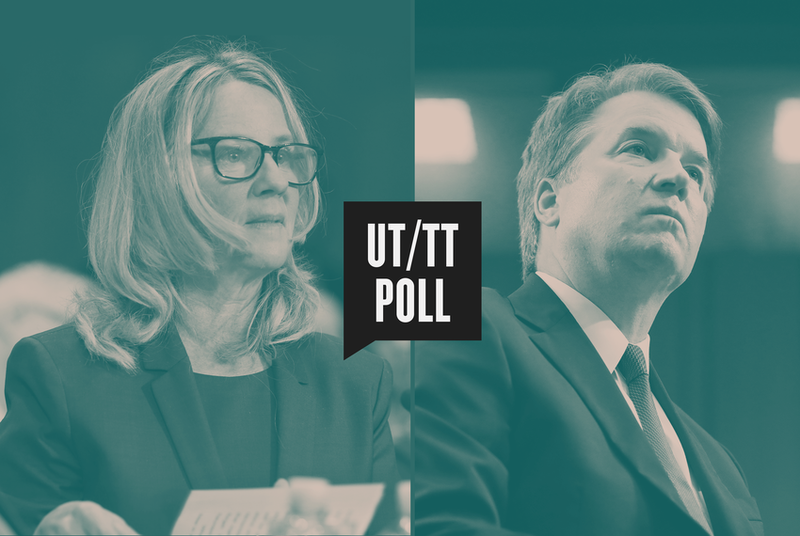 When it comes to the politics of the #MeToo movement and Brett Kavanaugh's rocky Supreme Court confirmation hearings, it's easier to sort Texas voters by party than by gender, according to the latest University of Texas/Texas Tribune Poll. Texas women and men disagree about sexual misconduct and gender discrimination, but the biggest divides on those issues are between Democratic and Republican partisans, according to the latest University of Texas/Texas Tribune Poll. From Brett Kavanaugh’s confirmation to the U.S. Supreme Court to a question about how often women falsely accuse men of sexual misconduct, Texas voters are more likely to answer according to partisan orientation than to their own gender, the poll found. Asked about the #MeToo movement, 37 percent of Texas voters said they have a favorable opinion and 38 percent said they have an unfavorable one. More women have a favorable opinion than a negative one, by 11 percentage points. Men have more unfavorable views than favorable ones, by 13 percentage points. Those significant differences are dwarfed by the partisan divide: Only 11 percent of Republicans have favorable opinions about #MeToo, while 70 percent of Democrats do. And while 65 percent of Republicans have negative opinions of the movement, only 7 percent of Democrats do. That’s echoed in Texas voters’ opinions on the newest U.S. Supreme Court justice, who drew his own accusations of sexual misconduct from multiple women during his confirmation. Male voters, on balance, have favorable opinions of Brett Kavanaugh by a 52 percent to 36 percent margin. Among female voters, 39 percent have favorable opinions of him and 43 percent view him unfavorably. The partisan splits are stark: 81 percent of Republicans have positive opinions of Kavanaugh, a view matched by 9 percent of Democrats. Only 7 percent of Republicans view him unfavorably, while 79 percent of Democrats do. Most Texas voters — 54 percent — said that if they were in the U.S. Senate, they would have voted to confirm Kavanaugh to the court. Texas women were split 50-50 on that question; men favored Kavanaugh 58 percent to 42 percent. Among Texas Republicans, 92 percent would have voted for confirmation. Among Democrats, 86 percent would have voted against. “The notion that this would break differently with Republican women turned out to be sadly mistaken,” said Jim Henson, co-director of the poll and head of the Texas Politics Project at UT. Rather than pulling the GOP toward their views or breaking from the party, Republican women swung to the party position in the wake of the Kavanaugh confirmation hearings. In a UT/TT Poll last February, 48 percent of Republican women said attention to issues of sexual harassment and assault was leading to the unfair treatment of men. That position has changed dramatically: In the latest survey, 77 percent of Republican women felt that way. Female voters (60 percent) were more likely than male voters (55 percent) to say false accusations are made almost never or occasionally. Among Democrats, 78 percent agreed with that opinion. But 52 percent of Republicans said such accusations are made somewhat or very frequently — a position shared by 50 percent of female Republicans. Voters were asked about the effects of “the recent attention paid to the sexual harassment and assault of women in America” and whether it’s helping address issues of gender inequality, whether it's leading to unfair treatment of men and whether that attention will ultimately improve the lives of most women. Voters were split on all three questions. While 46 percent think the attention will help address gender inequality, 42 percent do not. Men were more likely to say no, by 3 percentage points, and women were more likely to say yes, by a 9 percentage-point margin; neither group could produce a majority point of view, however. The partisan splits remain: Among Democrats, 73 percent said the attention is helping; among Republicans, 66 percent said it’s not helping. Half of all voters said the attention is leading to unfair treatment of men, a view shared by 60 percent of men and only 42 percent of women, and by 79 percent of Republicans and 18 percent of Democrats. It’s worth noting that women are more likely than men to identify with the Democratic Party, but among women, the numbers are split along party lines, too: 12 percent of Democratic women and 77 percent of Republican women agreed that the attention is leading to unfair treatment of men. More Texans (45 percent to 41 percent) believe recent attention to sexual harassment and assault of women is unlikely to improve the lives of women. That sentiment is shared by male and female voters alike; in both groups, more voters said it won’t help than said it would. Once again, the partisan differences are big. Two-thirds of Democrats said the attention will help, and two-thirds of Republicans said it won’t. Sixty percent of Texas voters said there is either “a lot” or “some” discrimination against women in the U.S. today. A third said there is either “not very much” or “none.” While 66 percent of female voters and 55 percent of male voters agreed that there is gender discrimination against women, 88 percent of Democrats said there is a lot or some discrimination and 57 percent of Republicans said there is not very much or none. Asked the same question about discrimination against men, a slight majority of male voters — 51 percent — said there is a lot or some. Only 36 percent of women agreed with that. Among partisans, 23 percent of Democrats took that position, while 60 percent of Republicans did. Who faces more discrimination? Women, according to 55 percent of Texas voters. That includes 66 percent of female voters and 46 percent of male voters. The parties raise their heads here, too: Among Democrats, 83 percent said women are more likely than men to face discrimination; among Republicans, 33 percent said women are more discriminated against, while 43 percent said men face the most discrimination in the United States today. Women are also divided on the issue: While 86 percent of Democratic women said women face more discrimination, only 40 percent of Republican women said so. Thirty-five percent of the Republican women said men face more discrimination. Just 3 percent of Democratic women agreed with them.